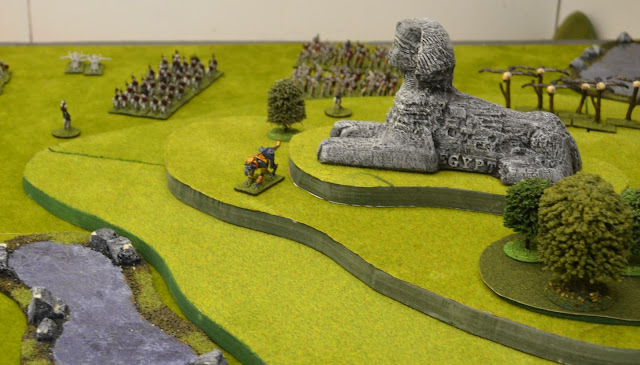 Terrain: Home built – Pyramids & Sphinx from cheap tourist shop in Egypt – vendor tried to convince me they were real carved stone and not resin !! This was to be a straight forward engagement battle with the first side to ‘break’ the other winning. The losing side must lose 50% of their units to be defeated. 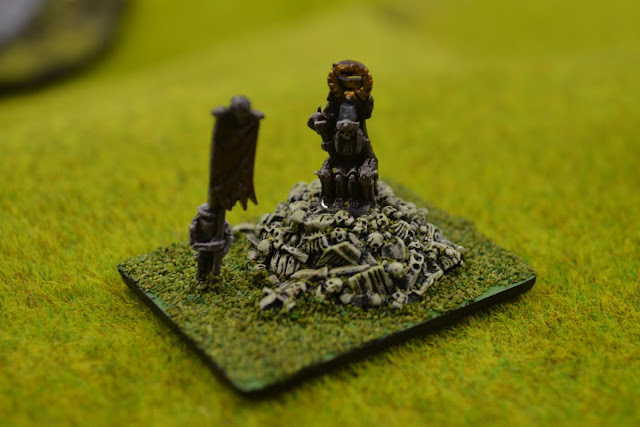 With the undead army units being significantly weaker and cheaper in points they outnumbered the forces of good by around 50%. 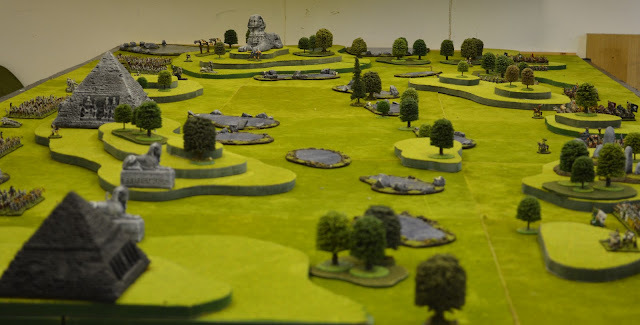 The battlefield was set up to resemble the valley of the lost Kings. Temples, Pyramids and a Sphinx adorned the peaks of the hill surrounding a valley sprinkled with marshland. Each turn the valley could fill with Marsh mist that would hinder visibility. To date the guns and rock throwers have been nullified by this mist closing ranges down to 30cm. With the forces deployed battle commenced. Opening the proceedings were the forces of the Tomb King. Units were quickly moved forward occupying the central higher ground and the northern hills. Battlelines of skeleton hordes awaited the army of good. 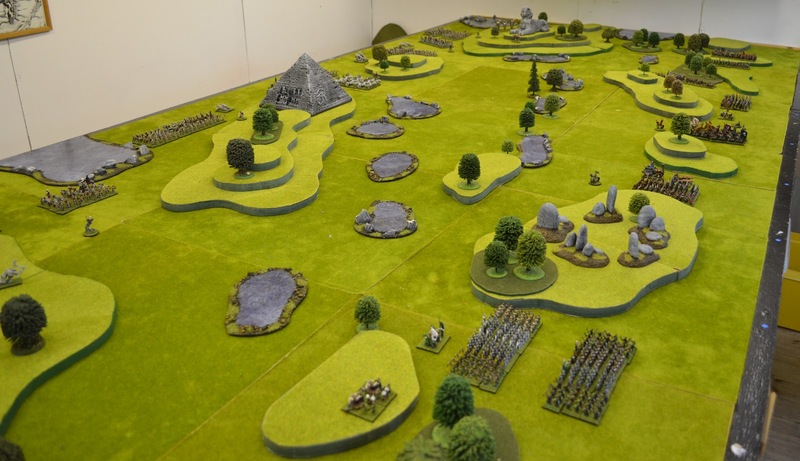 With no sign of the mist lifting the Imperial and Elven forces marched forward. Their general confident in the might of his heavy cavalry - nothing could stand in their way. The first engagement commenced in the North with a unit of Pistoliers advancing on the Northern (Sphinx) Hill. The charge was given but the force failed to make headway and was bounced against the supported undead lines. 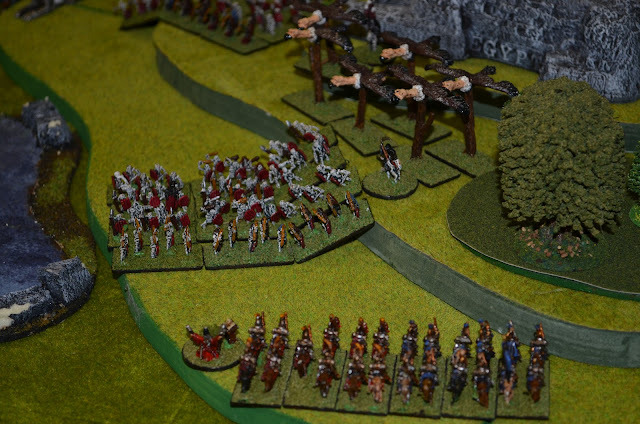 To the East the Elven troops advanced – massing for a push forward against the skeletal cavalry. Throughout the first few turns magic from the undead high priest played havoc with Imperial commands. Numerous units sat awaiting instructions unable to carry the fight to the enemy. By return the Imperial wizards made no impact. By turn three the undead unleashed their birds of death into the flanks of the western Imperial Cavalry – with dice favouring the defenders these creatures failed to make the breakthrough. 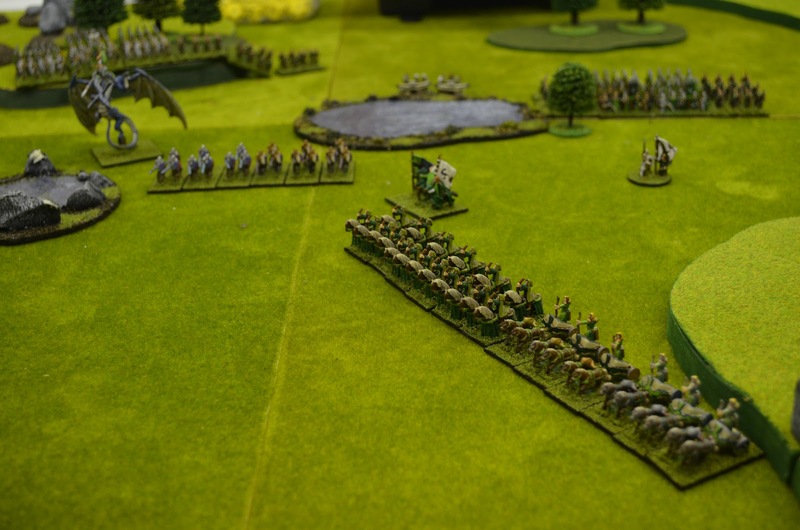 A rapid attack from undead skeleton cavalry now threatens the entire Imperial right/northern flank. The great thing about these mega games is that whilst losing on one area fortunes can be turned elsewhere. The Southern Flank saw Elven heavy cavalry smash through their weaker foes only to be destroyed to a man the numerous hordes. A frantic charge by undead chariots has decimated the remainder of the Elven cavalry but in the process has left most units decimated and disorganised. 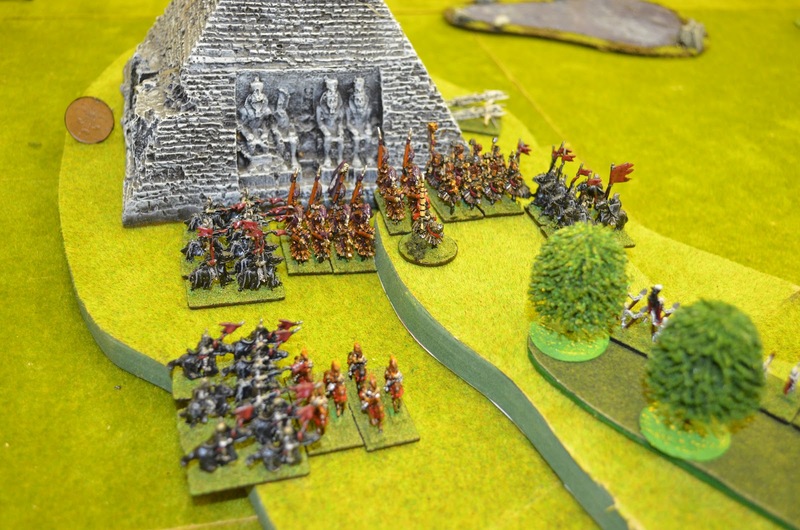 In the centre a heavy Imperial charge has gained ground on the large Pyramid Hill and awaits its next orders. Albeit they have been hamstrung by doom & despair spells (no charge). So at the end of the first night things are finely balanced – perhaps in favour of the dead ones. Both sides have suffered numerous casualties but with plenty left to play this will go to another night. 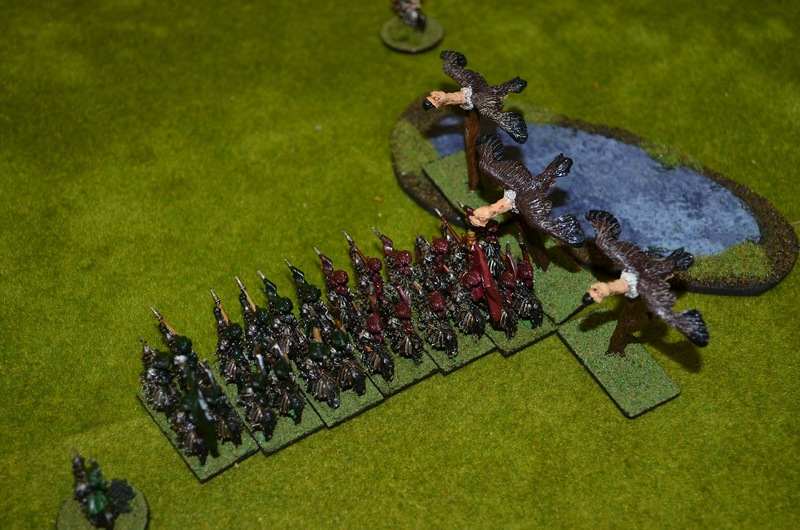 At the end of part one things were evenly balanced – the Elven Forces on the southern flank had secured a position of strength and were unleashing a storm of arrows into the defending undead. I say storm because things went quite well with a leading chariot and Zombie Dragon falling to the weight of arrows, but from then on the Elvish luck disappeared and the storm became more of an light shower. With an impasse in the South no real action progressed in this area of the battle for the rest of the game. 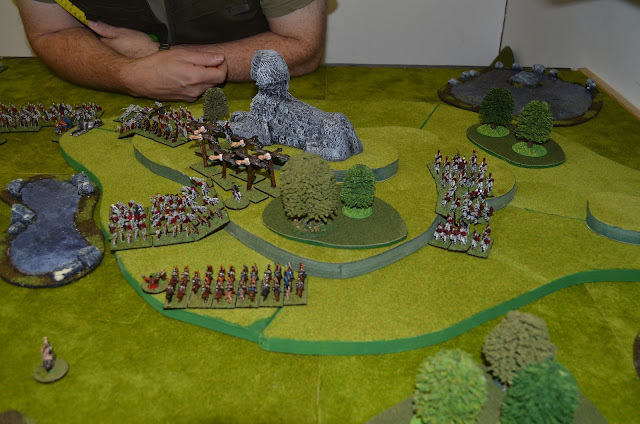 Lines were drawn and slowly and steadily the undead performed a manoeuvre worthy of Wellington and withdrew behind the shelter of the hill. Things on the Northern Flank also reached an impasse. 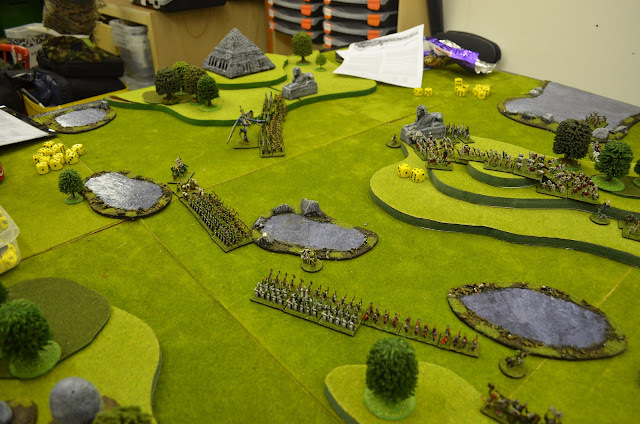 With the Imperial infantry holding the high ground and ably supported by the remnants of the Northern cavalry and heavy guns, the Tomb King himself decided to focus on the centre. Last week a large contingent of Empire Heavy Cavalry had fought itself bravely to the peak of the Undead held central hill. However their follow up moves were curtailed by some dastardly spells And poor orders. A relief column of Pistoliers bravely fought their way up to support but the damage was done. Unable to move the Undead general unleashed a brilliant series of moves (great command rolls on the dice) and managed to catch the stationary cavalry in a vice like pincer. With their fallen friends rising as the dead they were trapped and were mercilessly wiped out. With the initiative firmly in the Undead Kings hands he ploughed forward into the lightly defended centre of the Imperial positions. 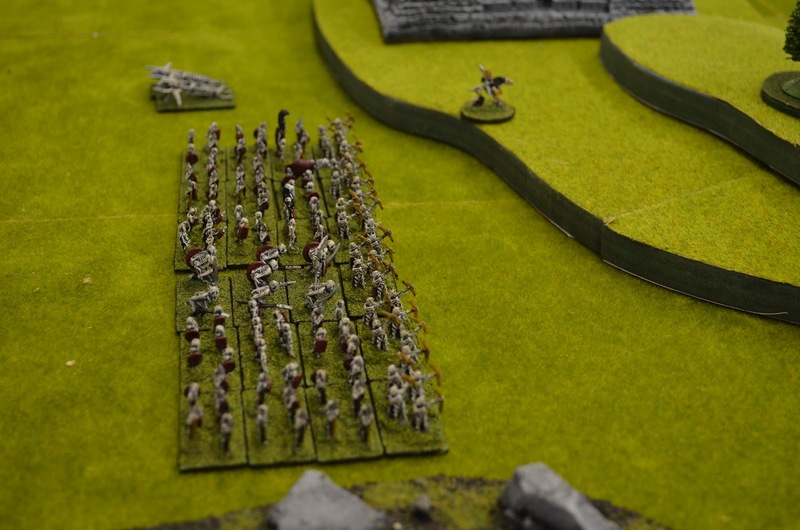 With the skirmishes developing into full scale miniature bustles could the Empire hold on. On two occasions hard fought fights were one by a single pip of the dice both in the favour of the dead. Lady luck had run out for the Empire. A further charge by the remains of the undead cavalry and chariots removed the central battery and medium human cavalry. The Empire was wavering and more of the dead were marching forward. 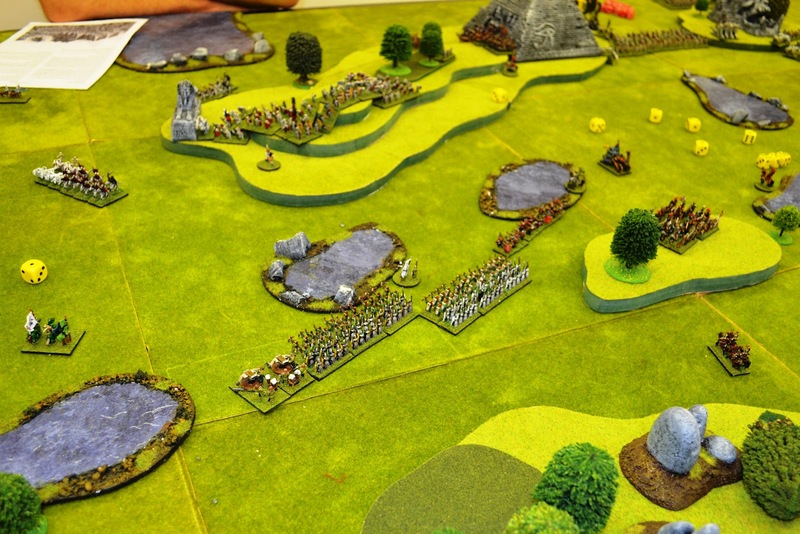 With midnight approaching the game was called to a halt – the dead had one the field convincingly. By trading weak units for expensive imperial forces their numbers would tell. A strong Undead command with great vision coupled with the loss of the fortuitous Imperial luck played the death tune for the Emperor. A great game and wonderful to have so many units on the table. 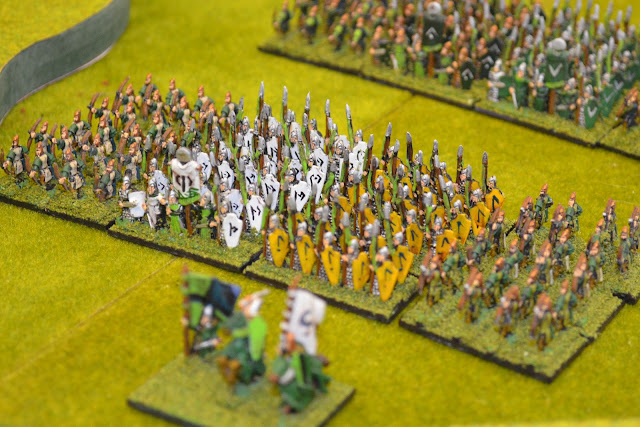 It was agreed that we would reverse the sides next time and allow the Undead to march against the hordes of the Orcs.